You are here: Home / reviews / Pleasant Prairie Seal Coating Job Well Done! Restored to its original glory – It’s an honor to hear words like this from our clients! Armored Sealcoating strives for excellence and 100% customer satisfaction on every job. We put time into doing a job right the first time. From the start to finish of your seal coating service, you can expect a high attention to detail in all preparation work, including crack filling, followed through to completion of TWO coats of asphalt sealant. We apply 2 coats to every driveway ensuring higher quality, longer lasting results. 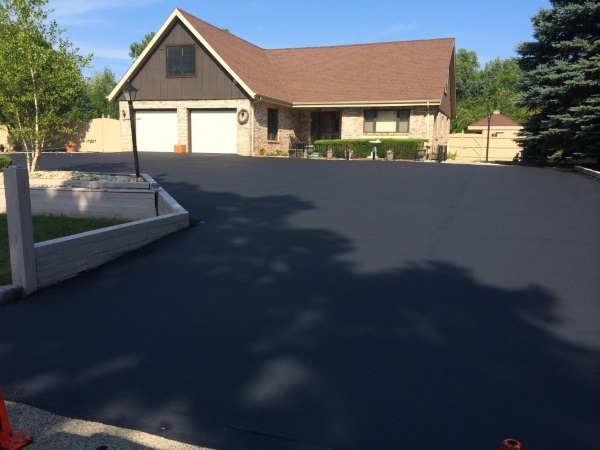 If you’re like this Pleasant Prairie homeowner and need your old, cracked asphalt driveway resealed; get a quote from Armored Sealcoating! Contact us for a free asphalt seal coating estimate today. Should I Seal my Asphalt Driveway? Kenosha Commercial Crack Filling and Seal Coating Satisfied Client!